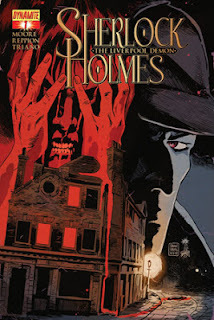 The Fellowship was fortunate enough to obtain a copy of SHERLOCK HOLMES: THE LIVERPOOL DEMON #1 from Dynamite Comics. Leah Moore and John Reppion write, and Matt Triano draws. Holmes and Watson have just wrapped up a tough case on the Liverpool dockside. They’re making plans to return to London when an old friend of Watson’s finds them. And while the old friend is explaining his business plans over dinner, Holmes spots something going on out in the rain. And what he sees is much more interesting to him than talk of trains. Okay, in all fairness I have to admit that I’m a longtime Holmes fan. Read all of the stories, seen many of the movies, and watched as many of the TV shows as I could find. So I always come to something like this with some skepticism. In short, I didn’t need it this time. This title has got the witty banter (with the competent Watson), the unusual puzzle, and the promise of a great Victorian adventure. I love it when writers have done their research, and it surely seems to be the case here. I’m really looking forward to seeing more of this story. SHERLOCK HOLMES: THE LIVERPOOL DEMON #1 is available now at your FLCS or by order from dynamite.net.